My name is T. David Kent and I created DK Designs, Inc. after having design opportunities with Atlanta Dental Supply Company, Architectural Services and John Wieland Homes. It was the experience that I gained from those three companies that allowed me to create my own design firm in 1989. From the beginning, DK Designs, Inc. has offered custom home planning, renovation services and developed a stock plan portfolio which has been published in numerous magazines and Internet publications. DK Designs, Inc. has been presented with several awards throughout its’ years in business. We also have been recognized with Professionalism Awards for Design Innovation. We have multiple publishers nationwide of our plan’s portfolio and sell plans throughout the United States and Canada. 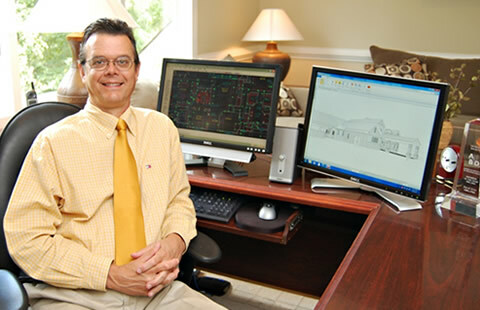 I am a Certified Professional Building Designer and a member of the National Council of Building Designers Certification, a past member of the American Institute of Building Design, Georgia Society and a past member of Residential Designers of Georgia. I have held the position of President, Vice President and National Director for the Georgia Society of AIBD. I have also held the position of Eastern District Director for the National AIBD. Copyright © 2019. DK Designs Inc. All rights reserved.